Our four-legged friends are always welcomed in Virginia Beach, where they, too, can “live the life,” from the Ocean to the Bay and at dog parks and hiking trails in between. Athletic pups looking to soak up the best of the outdoors will fall in love with First Landing State Park, where they can join their humans for a long, winding hike through different landscapes and habitats, offering plenty of opportunities to be mesmerized by and listen to the various species of birds that fly high above and the cyclists zooming by. Nearby, beach-loving pups will find plenty of scenic shores on which to stroll and frolic in the shallow waters of the Chesapeake Bay or, a bit farther south, discover island-like and pristine natural surroundings along the Atlantic Ocean at Sandbridge Beach. Doggies looking to be in on the action will find plenty of morning fun to soak up under the sun along the Resort Beach’s three-mile boardwalk, while taking in the sights and sounds of the hotels, restaurants, shops and entertainment along the way. In the evenings, head inland for more adventures with your furry friend at the Virginia Beach Town Center and dine al fresco, browse the artisan fairs or enjoy regularly scheduled live entertainment at the Fountain Plaza. 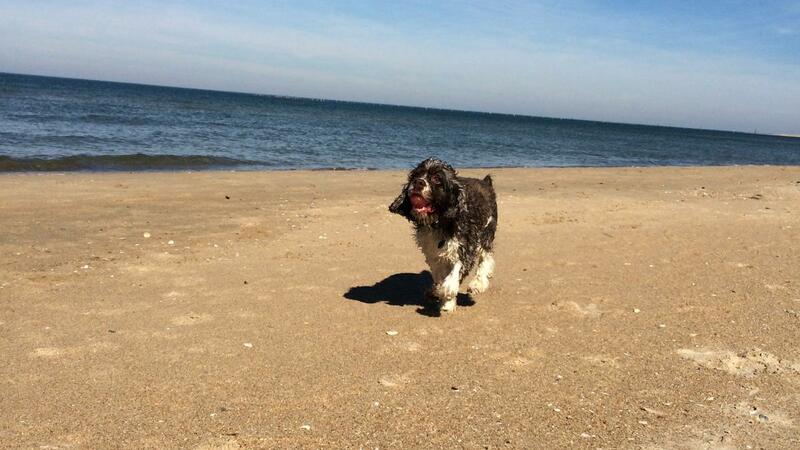 Whether swimming, hiking, fetching or just joining you for the ride, we love seeing coastal pets make the most of their visit to Virginia Beach. Before you travel, be sure to familiarize yourself with the seasonal restrictions, and as always, be mindful of keeping your fur-baby on a leash and cleaning up after them. Wishing you and Fido a paw-sitively perfect vacation this summer!